CONNEXIONS and Beit Zatoun are spotlighting grassroots archives this November with an open house and networking event November 24, a talk and discussion November 27, and an exhibit (November 16-27). 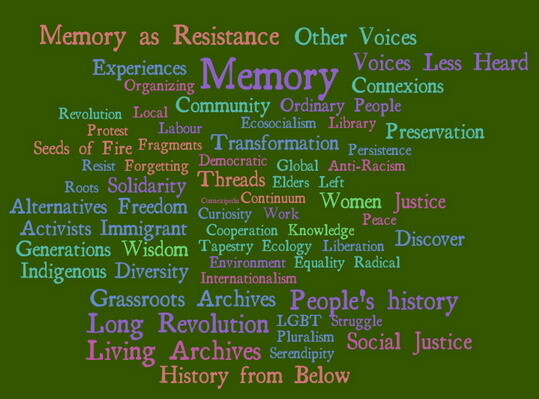 Grassroots archives play a valuable role in what has been called the battle of memory. Peoples history projects such as grassroots archives preserve and share stories of resistance, hidden histories, and alternative visions. Their role is particularly important as official archives are forced to restrict acquisitions, limit access and discard materials as funding is slashed. Join us at Beit Zatoun in looking at the future of grassroots archive projects. An open house and networking event for amateur archivists, keepers of the radical past, and friends and supporters of independent libraries, grassroots archives, and peoples history. Bring your stories, ideas, and examples of grassroots and radical history. The Connexions Archive is looking for a secure and permanent home for its collection and the team of volunteers who work on cataloguing and digitizing. It isnt alone. Other grassroots projects and basement archives face similar problems in preserving and sharing the history of activist groups and movements. They all believe that a knowledge of the past can be inspiring and subversive. How can we preserve the history of our movements? Where can we preserve them? Can we work together to digitize and share: Archive locally, share globally? Join us at Beit Zatoun for a talk and discussion with historian Natalie Davis, Ulli Diemer of Connexions, and Dennis Findlay and Helen Lenskyj of the Canadian Lesbian and Gay Archives. Admission free but contributions welcomed.